Energy Saving involves simple yet effective ways of decreasing your energy use. We are paying a lot more these days for energy of all kinds to heat our homes and work places so reducing our energy needs isn’t just glamorous but helps to save money and the planet. Energy saving isn’t just about switching off the lights or turning down the boiler or thermostat, its also about increasing energy efficiency so that the lights, hot water or the heating system does exactly the same job while using less energy. On average we may be able to cut our home energy usage by at least 20 percent, which shouldn’t take much doing, or even more if the house is particularly old or wasteful. Of course saving energy may be more difficult if you already live in a newer or very energy efficient home. While each home is different, heating, cooling and lighting are the major energy users in buildings so it only makes sense to save the total amount of energy consumed in the home by these devices. A good and easy place to start any energy saving regime in the home is to cut down on what are called “phantom loads”. A phantom load is any electrical load or device which uses or consumes electrical energy when it is thought to be switched off. For example, leaving the TV in stand-by, or leaving the phone charger plugged into the wall socket when not charging a phone. While all these issues may seem small, phantom loads in a typical house, especially one with teenagers, can consume quite a few kilo-watt hours of electrical energy per day without you knowing making it an appealing option for energy saving. Energy saving and efficiency measures help reduce your electrical load and therefore lowers your energy demand. 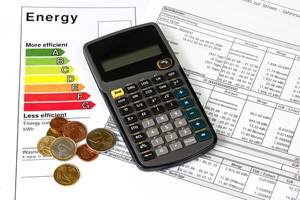 Since energy costs generally represent a large share of the total expenses for a typical home, achieving energy savings throughout the home can bring about significant financial gains. The cheapest and simplest way to reduce your electrical demand and therefore your utility bills is by behavioural changes. Cut Down On Energy Consumption: – This is about reducing your energy needs by being smart in what you use. Lighting: Replace high wattage light bulbs with more energy efficient bulbs such as LED light bulbs which use up to 75% less energy and last up to 20 times longer than standard incandescent light bulbs. They give out the same amount of light but use less energy so rather than looking for the wattage, look for the lumen’s or how bright the new bulb is instead. Also, by keeping the light bulbs clean from dust, you’ll get more light. Baths: Replace soaking in the bath with a daily shower and use a low-flow shower head. Also, don’t let the hot water run constantly while you’re shaving or washing your hands and face, you’ll be surprised how much water and energy you could save this way. One of the most expensive ways to heat bath water is with an electric water heater. An energy efficient natural gas water heater can heat the water for half as much, or use solar thermal collectors and use the sun’s heat for free. Laundry: Use your washing machine’s half load setting for small amounts of clothes and choose a lower temperature setting for larger loads. Its the washing powder that cleans the clothes not the amount of water. HVAC: Check your heating and air conditioning filters. Dirty HVAC filters not only increase energy usage, they may also damage your system. Why not have your HVAC system serviced. Regular maintenance can extend its life cycle and operate more efficiency saving you money. Heating: Reduce the hours your heating system is operational and check for air leaks through windows and doors. Seal and weather-strip around all seams, cracks and openings to protect against drafts. Upgrade your attic and loft insulation to a minimum of R-38 (about 12-14 inches), which will help save you money on heating and cooling costs. Appliances: Buy energy efficient rated appliances for your home and kitchen. A-rated energy star appliances use at least 20 percent less energy than older models. Set the refrigerator temperature to 35 to 37 degrees Fahrenheit (about 3o Celsius) and the freezer temperature between zero and five degrees Fahrenheit (about -15o Celsius). Keep refrigerators and freezers full whenever possible as they retain the cold better than an empty one. Also unplug unused refrigerators or freezers. Turn Down the Dials: – This is about reducing your energy consumption by lowering the settings. Home Heating: Turn down the central heating thermostats to 78 degrees Fahrenheit (25o Celsius) in summer and 65 degrees Fahrenheit (18o Celsius) in winter. Each degree higher or lower can significantly increase your heating costs in winter and cooling costs in summer. Change old bimetallic strip thermostats with newer programmable thermostats to manage your heating system more efficiently, saving energy. Why not use a fireplace to heat your home. Water Heating: Check and turn down the thermostat on your boiler. Make sure the thermostat is not set above 120 degrees Fahrenheit (about 50o Celsius). Why not lower the night time thermostat setting by 10 degrees or so while your asleep to reduce your heating costs. Heating water to a higher temperature than is needed not only increases your energy usage, but wastes money. Reducing high water temperatures is a good energy saving tip. Radiators and Ducts: Switch off radiators and close heating ducts in the rooms you’re not using regularly and keep internal doors shut. Otherwise draughts and poorly insulated windows will mean you’re burning energy unnecessarily. Fully close shutters, shades and curtains at night to help keep the heat inside the rooms during the cold winter and partially close them during the day to help keep the suns heat outside during the hot summer. HVAC: Air-conditioning is a big electricity user and the colder you set the thermostat dial, the higher your utility bill will be. Turn-off the air conditioning unit (AC) when no one is home to save money, or why not use window fans to blow the hot air out or to bring cooler air in instead of switching-on the AC unit. Smart Appliances: Many manufacturers nowadays produce smart appliances which can be connected to smart electric meters or to home energy management systems to work only during off-peak hours. Smart appliances don’t just reduce energy or water consumption, they use subtle ways of saving energy by using cheaper electricity at night. Shut Down When Not Needed: – This is about turning things “off” completely when not in use to reduce phantom loads. Lighting: Get into the habit of turning lights off when you leave a room, even if you’ll only be gone for a moment. Use outdoor motion detection sensors and photo-cell lighting controllers or install automatic timers on indoor and outdoor lighting circuits. Dimmers can save electricity when used to lower light levels. Electrical Appliances: Mobile phones, TV’s, laptops and iPad chargers left on standby are still using energy. Switching them off and unplugging them once they’re fully charged is a great way of saving energy. Switching unused appliances off is a good energy saving tip as it eliminates phantom loads that can secretly consume electrical energy in their stand-by mode from a single tiny watt to many ten’s of watts without you knowing it. Water Heating: Turn off your water heater when your home is empty for two or more days. Fix dripping and leaky taps and faucets especially for hot water as this can waste gallons of hot water in a short period of time. Why not insulate your water heater and pipes to save energy and money. Close the Chimney: Closing off the chimney with a metal damper or panel when the fireplace is not in use, stops the warm air in your home from getting sucked up the chimney due to drafts causing cooler air to enter the room. Lock and sealed windows to improve their seal and prevent the cold air from entering the room in the first place improving your homes energy saving performance. The potential for energy savings by using more efficient appliances and habits at the point of use is very large. An energy-efficient home will keep you and your family safe and comfortable while at the same time saving you money. Whether you take these simple energy saving tips above, or make larger investments to make your home more energy efficient, over time you will see lower energy bills putting money back in your pocket. Avoiding careless habits like leaving the lights and fans on when no one is around, or cranking up the heat or HVAC all contribute to a wastage of energy. Reducing your energy consumption and needs by installing energy saving devices like LED bulbs, compact fluorescent bulbs (CFL), switching unused appliances off, eliminating phantom loads and practising energy saving routines are all easy and doable ways to save you money. Just by replacing the three or four most frequently used light bulbs in your home with more energy efficient equivalents could save you a lot of money in the long term, as every kilowatt-hour of electricity or gallon of water you save gives you more control over your energy bill. Turning your house into a more energy efficient home using thermal insulation, temperature control, passive heating and cooling or by using renewable energy resources are some of the many methods and measures available for the integration of energy-efficient and solar technologies in the home to consume less. Energy Saving through renewable and non-polluting energy sources such as the solar design of photo-voltaics and solar hot water panels replaces the amount of purchased energy you buy from the utility companies. The amount of energy used today to heat domestic water and for space heating is enormous and the possible energy savings in using the suns solar energy is an attractive option for saving energy. Don’t forget, the more energy you save, the less coal is burnt and the less impact we have on the environment. Saving energy and money is not that hard to do. The key to saving energy is to take a whole-house approach by looking at your home as a complete energy using system rather than interdependent rooms and areas. Installing more A-rated energy efficient appliances will pay for itself in the long term. Remember, when we waste the energy in our homes, we are effectively throwing the money away and which we could use for other things. For more energy saving tips, or to explore the advantages and disadvantages of how saving energy can help reduce your utility bills, then Click Here to get today direct from Amazon your copy of one of the leading books on saving energy and energy saving tips. Replacing appliances that might not be working properly is a great way to keep everything in working order. I have a sister that is thinking about getting more energy efficient in her home. Looking into kilo-watts of electricity might be a great place to start. This website is awesome. This helped me with saving energy in your home office it was very informative. I must totally agree with these awesome and effective tips. I’ve tried a few of them and really it worked. Thank you for creating this article. A good way to save on your electric bill is to generate your own clean electricity. That’s good for the environment as well as your wallet, and it’s really easy and cheap to set up. You can even get paid by the power company if you generate enough electricity, and you’ll eliminate your bill completely. Starting cost in the installation of solar pannel seems expensive but for a long term, its give much better results.we should move our usage to renewable source of energy as much as we can .Now for our future ,its is a neccessity. Saving energy through renewable and non-polluting sources such as solar design is a good idea. Making sure you have your home upgraded to the best products would be very useful. Having an electrician come to your home and give you energy management tips would probably help you know what you need to improve on and the best ways to do it. Sound advice. I changed the light bulbs in our house for led ones from the local diy centre, less light output but use much less power. Good insulation also helps. I like what this article recommends about closing off the ducts in rooms that don’t need to be heated. It makes sense that this could be a good way of making sure the furnace doesn’t have to work too hard. It’s something to remember when looking to have new ducting installed because good ducting could help prevent future problems with the system.